The Benson Museum of Local History opens in new location on Main Street on May 28, 2010. After three years of fund raising, building renovations and exhibit design and installation, the museum will be open to the public Wednesday-Saturday approximately 4-6 hours a day. 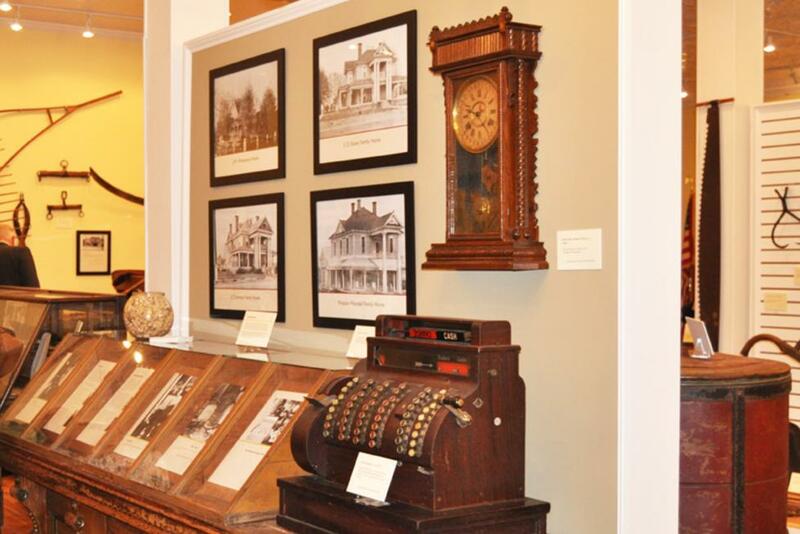 The Johnston County Visitors Bureau has been involved with the board of the Benson Museum of Local History for the past year to help develop the new museum. Not only has the Visitors Bureau supported the project with tourism-related funding, giving the project $50,000 for capital improvements, but the bureau has helped to development the museum from the ground up. The board held an opening reception and fundraiser on Thursday, May 27 with over 125 people attending and helping to raise the $50,000 needed to finish the back section of the building. Future plans include having a local art gallery and presentation area for groups visiting the museum for special programs. We are excited for the Town of Benson and the new museum, and now the Visitors Bureau will begin the marketing process to draw visitors and school groups to the facility. The museum is local in nature as far as the stories of the people of Benson goes, but they are unique in many ways. Many may not know the internationally acclaimed composer Hunter Johnson was from Benson or that Jimmy Capps of Nashville&apos;s Grand Old Opry is from Benson. There is an abundance of farm related artifacts pertaining to the turpentine industry in Eastern NC, cotton-buying, tobacco farming and the tools and equipment local farm families used for work, caring for and feeding their families. Also unique is Benson&apos;s thriving merchant business which built up around the Wilmington & Weldon Railroad as soon as it opened in October, 1886. The town may have been small, only 200 people in the early years, but it served residents and farm families for miles around, as it still does today. Main Street Benson continues to offer hardware, appliances, car dealers, restaurants, bed & breakfast at an Historic home, the Preston Woodall B&B and many retail establishments remain and thrive...in this town of 3,600 people. The museum is located at 104 W. Main Street in the Rose Woodall building that was originally a furniture and casket making store. The board&apos;s decision to keep the character of the building with the tin ceilings and refinished hardwood floors supports the town&apos;s commitment to be authentic. The exhibit rooms tell the story of the town and its founding family A. M. Benson, local merchants, military heritage from the Spanish American War to World War II, local doctors, farming, education, home life, Mule Days, the Benson Singing Convention and local artists like Carlie Tart, Jimmy Capps and Jim Thornton. Each exhibit theme has its own "room" that visitors can walk into and read about local history and see artifacts the board has collected over the past 23 years. To be involved in tourism development for a community means more than advertising. It means that serving on area boards and working with events and festivals to broaden the scope of activities and improving the "visitor experience" is just as important. If attractions, festivals, and tourism-related businesses succeed, especially in these difficult times, then the community or destination will ultimately succeed as well. Having quality attractions that interest the traveling public is vital to bringing more visitors to the county, therefore bringing more dollars to the county. Tourism is economic development and we have to try harder in rural communities to build our tourism product. We have to create our own vision of tourism, and then make it happen!